Need a fun chicken recipe? 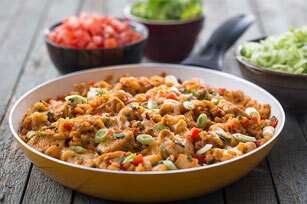 Then check-out our recipe for Mexican-Style Chicken and Rice. It's like a fiesta in a skillet! Heat oil in large nonstick skillet on medium-high heat. Add chicken, yellow onions and garlic; cook 4 min. or until chicken is no longer pink, stirring occasionally. Add rice and cumin; cook and stir 1 min. Add peppers, water and salsa; stir. Bring to boil; cover. Simmer on medium-low heat 15 min. Remove from heat. Let stand 5 min. Stir in half the cheese; top with remaining cheese, green onions and cilantro. Serve topped with chopped tomatoes, sliced jalapeño peppers, shredded lettuce and/or sour cream. For a touch of heat, add hot pepper sauce or 1 minced fresh jalapeño pepper to the partially cooked rice along with the red peppers, water and salsa.